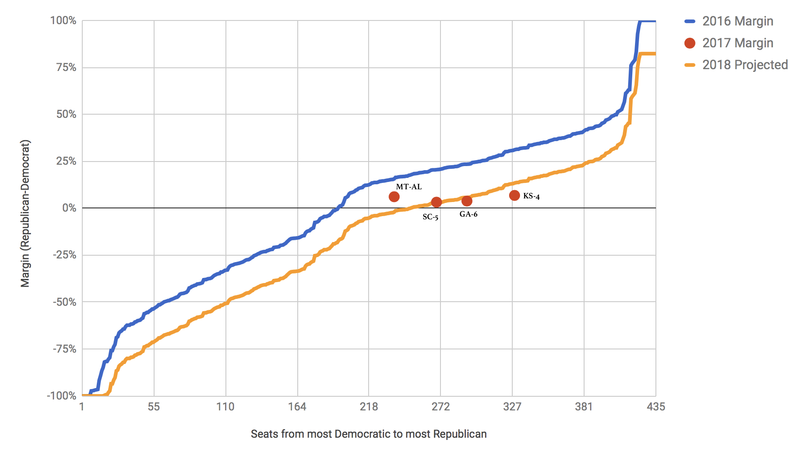 Election Graphs 2020 is live! So, I mentioned a while ago that I wouldn’t be posting here regularly about developments over on my site Election Graphs. And I won’t. But I did want to mention that although I’m about four months later than I had wanted to be, and I haven’t yet made some of the changes and additions I have been thinking about, Election Graphs 2020 is now live and up to date with the sixteen 2020 state polls that have already been released, and I’ll be continuing to update it as new polls are released. 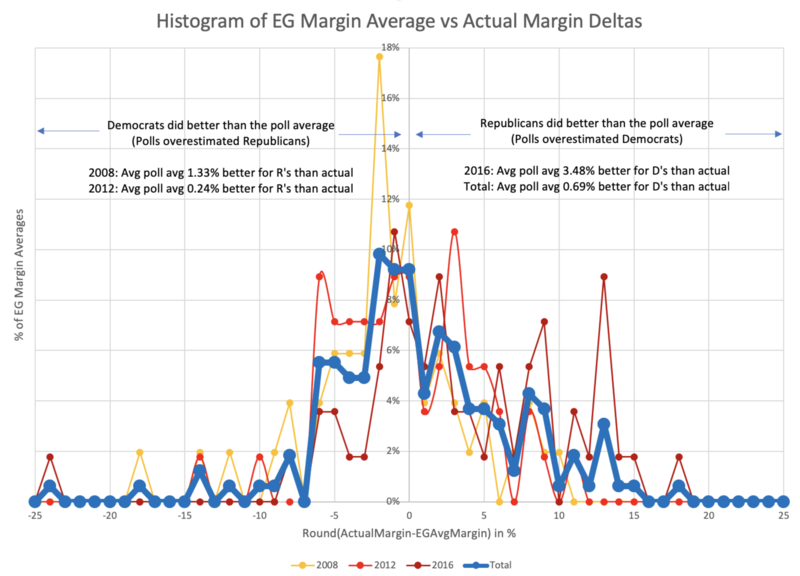 2019-03-03: The 2020 Starting Line – A post looking at the average state by state election results for the past five cycles (2000-2016) to try to define what the “starting line” for the 2020 race looks like. This places each state where it would be based on this nearly 20-year history. 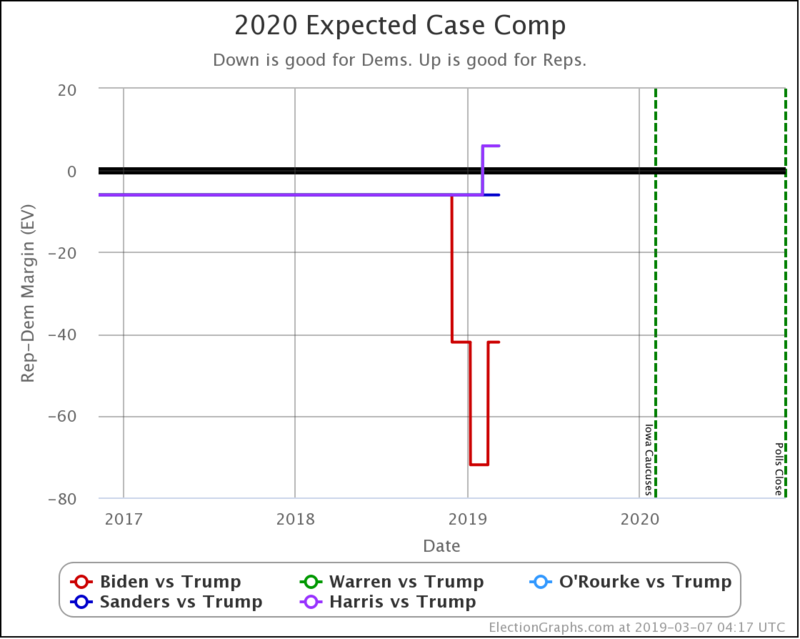 At this point, as new polls come in, I’ll be updating the Election Graphs Electoral College 2020 page regularly as new polls come in, and when there are notable changes, I’ll be doing blog posts on the main Election Graphs page. That kind of stuff is now over there, not here, so if you want it, you either need to be checking ElectionGraphs.com itself, subscribe to it with an RSS reader (RSS link), follow @ElectionGraphs on Twitter, or like and follow Election Graphs on Facebook. Hope to see some of you over there! Maybe she didn’t win her race this time… but I’m pretty sure she isn’t done with public service of one sort or another. Like her Facebook page to keep up with her in the future! I Voted For My Wife! Just finished filling out my ballot. I got to vote for my wife! We will be dropping all three ballots from our family off at our closest drop box very soon. If any of you actually live in Snohomish County Fire District 1 (map below) and haven’t voted yet, there is still time! Ballots need to be postmarked today, or in a drop box by 8 PM this evening. My wife and I thank you for your vote! 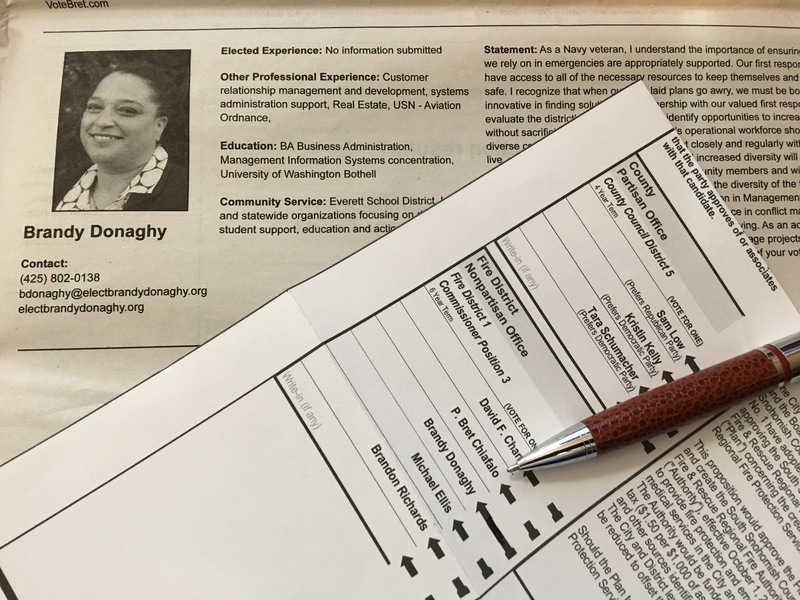 Voters’ Pamphlets and Ballots Dropped – Vote Brandy! The official voters’ pamphlets dropped a few days ago for the local primary elections on August 1st, two weeks from today. The ballots have been delivered as well. People are already voting. The above is my wife Brandy’s section of the voter’s pamphlet. I’m very proud of her. She’s been getting lots of very positive reactions at various local events, and we keep hearing from more supporters. Win or lose, this has been a great experience. But of course we want Brandy to win, right? There are five people running for Snohomish County Fire District 1 Commissioner Position 3, and the top two from the primaries move on to the general election. So if you haven’t yet, it would be great if you took a few minutes to help out by doing a few things… ESPECIALLY if you live in Snohomish County… but even if you don’t. 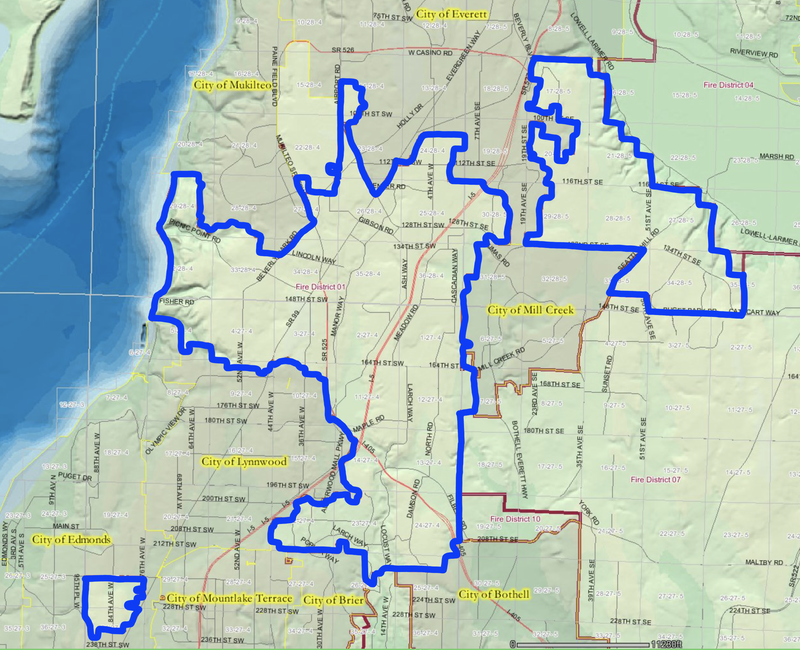 And finally, of course, if you actually live in Snohomish County Fire District 1 (map below), VOTE for Brandy! Back in March I took a look comparing Trump’s favorability rating (% saying they have a favorable opinion minus % saying they have an unfavorable opinion) to his net job approval (% approving of his job performance minus % disapproving of his job performance). This was interesting because these two ways of measuring Trump’s popularity were not really moving together. Net job approval is much more volatile than favorability rating. This makes sense. People are basically answering, “How do I think Trump is doing RIGHT NOW?” vs “How do I like Trump overall?”. Both have been trending down… down meaning worse for Trump… with the job approval swings looking much more impressive than the slow gradual decline for favorability. I actually think the favorability number is the more critical one to look at though. Job approval going down just means Trump had a bad week or two. It can easily bounce back if the next week goes better. Favorability going down though probably means people who voted for Trump are actually losing faith in him. They are not just saying he didn’t do great recently, they are saying they no longer like him. Big difference. And that has been slowly heading down since the beginning of February, and seems to have accelerated since the second half of April. Favorability swings can be reversed too of course, it just seems harder to move than job approval. Having said that, these charts are extended back before the election for a reason. 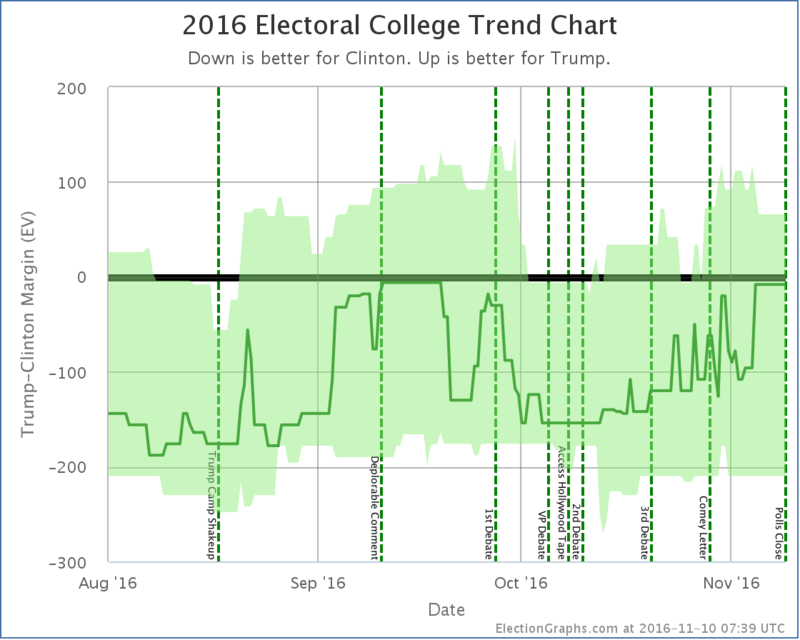 Note the huge swing upward in Trump’s favorability that started a couple weeks before the election and peaked in December. That was a big move in Trump’s direction. A big part of that was just an election bump and people “giving him a chance”, or giving him a boost simply for being President Elect. But it just shows that the right events can move things a lot pretty quickly. And it shows that Trump has still not come anywhere close to losing all of the additional people who started thinking more favorably about him during that time period. Some of them, sure, but he is still looking a lot better now than he was right before the election. To all the folks hoping for Congressional Republicans to turn on Trump, I’m thinking you have to see the blue line above break the October low before you start seeing any of that sort of thing happen. 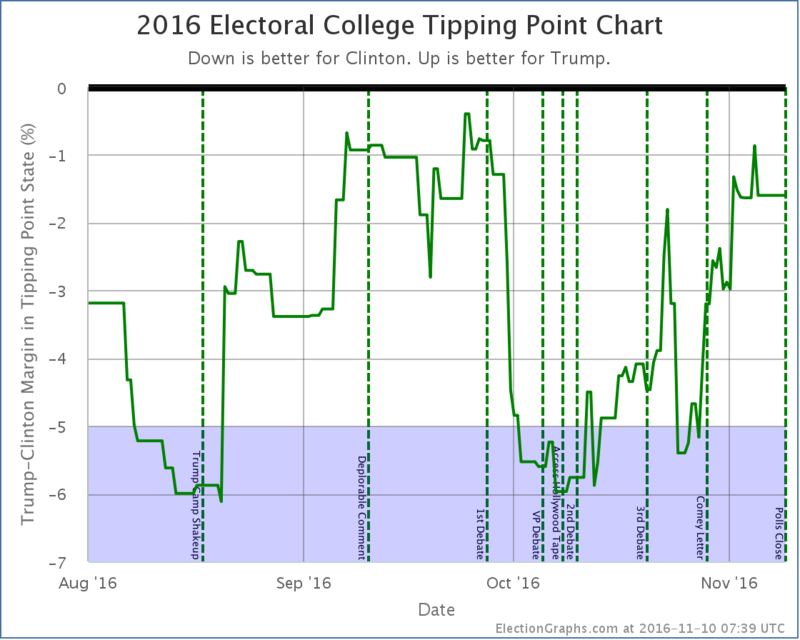 I’ve gone all the way back to the beginning of October to show the last inflection point prior to the election. Trump’s favorability reversed direction and started improving around the middle of October after bottoming out at -25.4%. (Bottoming out for that time period anyway, he was worse than -30% at a couple times prior to winning the nomination.) Roughly speaking this last pre-election reversal came somewhere between the 2nd and 3rd debate. Then after he won the election the improvement in his favorability accelerated dramatically, moving to by far the best levels he had ever seen. Presumably this comes from people just feeling more positively about him simply because he won the election. Since December 1st, Trump’s net favorability has stayed in a very narrow 1.8% band from -5.6% at the best, to -7.4% at the worst. For all intents and purposes, Trump’s favorability has been flat for over three months now. Now, it has never been positive, but it has not been getting worse for Trump… or better. Just flat. As of inauguration day though, there was an additional measure. Job Approval. This actually started out positive, with more people approving of Trump’s performance in the job than disapproving. But this didn’t last long. Aside from a slight bump toward the end of February, the trend has been down. The longer Trump has been President, the lower his net job approval is going. It will be interesting to see how far this trend continues. The favorability line has been the line I have watched more, leaving me with the impression that the public is so polarized that virtually nobody is changing their mind (in either direction) about Trump. But the job approval numbers tell a different story. This number is indeed shifting, and shifting away from Trump dramatically. Why the difference? Well, of course, these are different sorts of questions. Favorability essentially measures how the public feels about a person in general. How much they “like” them. Job approval specifically measures how people think the person is doing in the job. It is very possible for someone to feel favorable about Trump (that is, they like him), while still thinking he is doing a bad job. 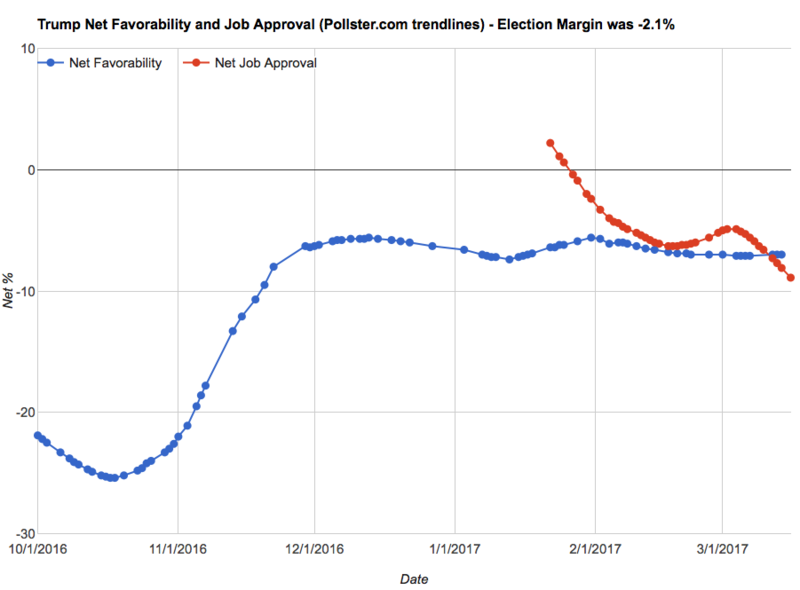 My gut feel is that while the job approval number is important, the real signal of a change in Trump’s political fortunes will be if the favorability numbers start to drop as well. We haven’t seen that yet. In fact he is still doing quite a bit better than he was right before the election. 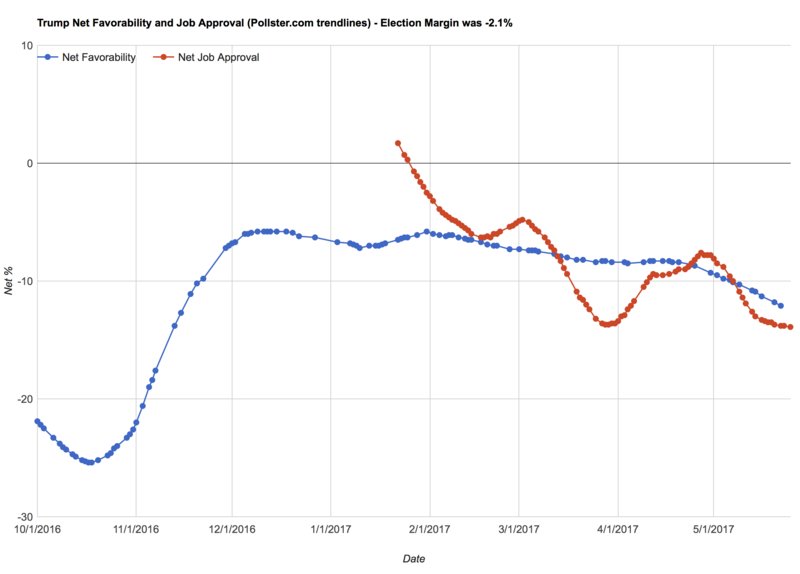 But surely if job approval keeps falling, at some point favorability will too… right? *This is also where looking at separate trend lines on job approval for approve and disapprove rather than just the net value is interesting despite my preference for the net, because it looks like approve numbers are flat, while disapprove numbers are growing, which means that it isn’t so much people shifting from approve to disapprove, as folks who were undecided picking a side… the disapprove side. But I don’t think this changes the overall picture I’ve described.